It’s a rare privilege to live in an off-the-beaten track Australian wilderness, close to a capital city, so, in-spite of the busyness of building Nightfall’s luxury tent accommodation, we’re always keen to be involved in activities which help protect the environment which sustains us. 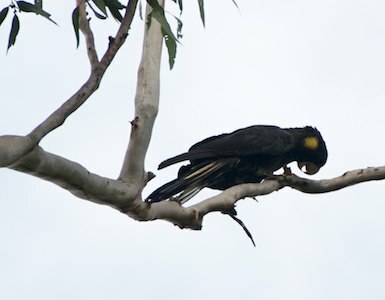 Last weekend it was time to count birds – specifically the Glossy Black Cockatoo (Calyptorhynchus lathami) which is listed as vulnerable in Queensland and a threatened species in Australia. 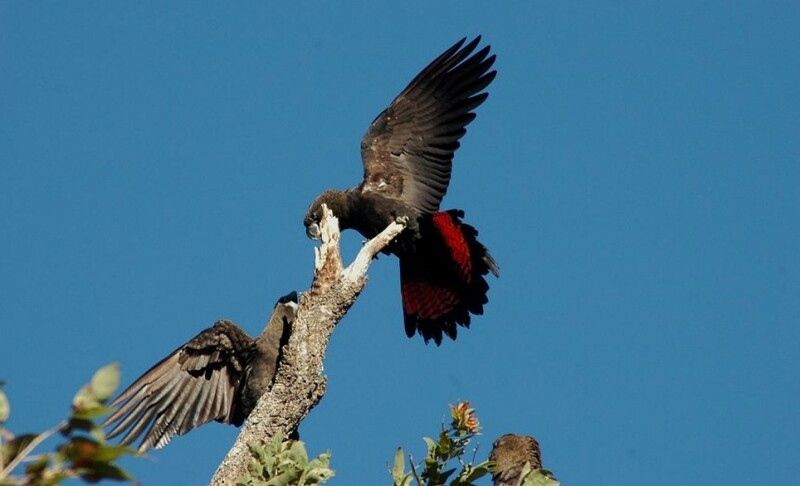 As part of the development of regional conservation strategies, the annual Glossy Black Survey collates data from volunteers across the State, recording sightings, nesting and feeding habits of these gracious birds. At Nightfall, we had five sightings on survey day, which is consistent with our experience at our luxury camp at this time of year. At the moment, as if like clockwork, the Glossies fly over Nightfall at sunrise and sunset, en-route to nearby feeding sites, their favourite water-holes and their Eucalyptus roosts. 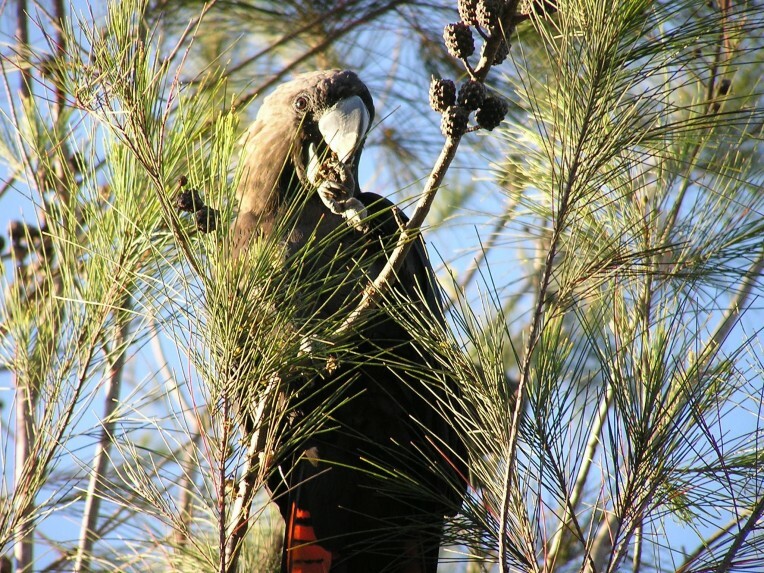 Next year, we hope to be able to take a group of guests into our forest to spend time observing the birds feeding in a grove of Casuarina trees of above our camp. 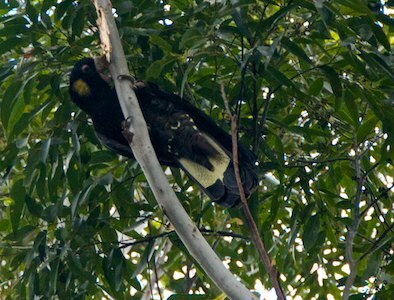 Glossy Black Cockatoos have large bulbous beaks, specifically designed for chewing the Casuarina cones which are their primary source of food. 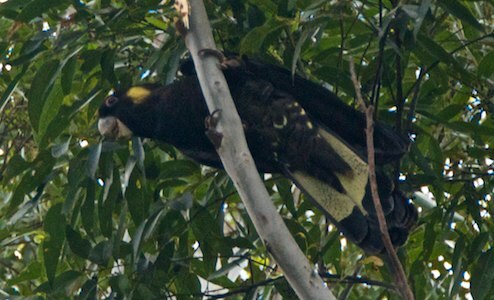 South-east-Queensland‘s other large cockatoo – the Yellow Tailed Black Cockatoo ( Calyptorhynchus funereus) – also dropped into Nightfall on several occasions this week. Their distinctive raucous calls make it easy to know when the Yellow-Tails are about. The attraction of Nightfall: the bark of the majestic Flooded Gums (Eucalyptus Grandis), which line Christmas Creek. It’s fascinating to watch as the birds find what appear to be the ‘good bits’, all the while squawking away to each other and occasionally putting on a show, fanning their stunning yellow and black tails. Now all I need is a longer zoom lens to be able to better capture their antics! The Eucalyptus Grandis, so loved by the Yellow-Tails, are part of an endangered Queensland eco-system. Coincidently next week, at Nightfall, we begin our part of a larger conservation program to help protect the Eucalyptus Grandis eco-system and our creek-side habitat. The SEQ-Catchments and SEQ-Water project, in collaboration with Scenic Rim Regional Council, will build creek bank resilience in the headwaters of Christmas Creek at Lamington, contributing to improved water quality in the sub-catchment of Brisbane and the Gold Coast. On the ground, it means lots of hard work, removing weeds, stabilising creek banks and planting trees along several kilometres of creek bank, from where Christmas Creek emerges from the main section of Lamington National Park to just below Nightfall. The tumbling waters of this section of Christmas Creek are already crystal clear and clean enough to drink. We’re determined to keep it that way!